It’s sunday once again which means it’s a day to relax, take it steady, drink that extra cup of tea you promised yourself in bed and think about tucking into a nice sunday roast. Seeing as it’s a day of ease I think the music should follow this. I was torn between posting this, and a jazz song by Miles Davis which is essential Sunday music in my opinion. But I decided to go for Jasmine Flower, which is a piece of traditional Chinese folk music. I nearly posted this song in January originally but kept opting for other choices in the end. I discovered this piece of music whilst I was browsing for some chinese guitar tabs. I found a song called jasmine, called it up, and started playing the tab with no real structure or form, playing in what they call free time. I had a musical life-changing concert when I saw Tommy Emmanuel and it made me look at and hear music in a different way. No doubt his version of Michelle by The Beatles sub-consciously inspired my guitar musings that day. I should point out here that Milky is sat beside me at the moment and as such helped me pick out the performance of Jasmine below. I thankyou for your help my darling!! A Song A Day: Feb 14th – Monday Mornings, Valatines and Giveaway Draw! It’s Monday! My favourite day of the week. That may shock a few, but I always like that feeling of a new week bringing new goodnees and that. I have a good week planned. I’m spending time with Milky, I’ve got some potentially exciting job prospects on the table also! I’ve been invited to the Birmingham Hippodrome Theatre to take a look around backstage in a meet and greet session. I’m very much looking forward to it – It could be a fabulous opportunity for me. I became interested in Video and Film via an initial interest in LX for the stage and some of the skills translate across. Fingers crossed! I’m also going to be stepping things up on this blog. I’ve got a neat idea and want to see if it’ll work – More to follow naturally! Before I get onto the songs, I need to attend to the matter of who won The War Of The Worlds CD in my recent giveaway competition. Thankyou to everyone who visited my blog and subsequently followed me on twitter and the link. It’s great to have your support. As for the giveaway, there are 112 entrants in the draw. They’ve been numbered as the comments came in. I used the random number generator over at random.org to pick out a number between 1 and 112 inclusive. 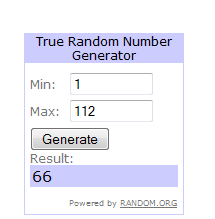 As you can see from the image the winner was entrant number 66! That means the winner of the giveaway and soon to be receiving a brand new copy of Jeff Waynes Musical Version of War Of The Worlds is…. lazyboyblue – congratulations to you. I’ll be making contact shortly to arrange posting. Well done! There will be more giveaways in the future if I have my way! Now, that’s sorted… onto today’s posting. It’s valatines day in the UK so I can’t realistically post anything else besides a message to my wonderful girlfriend Milky. It’s fast approaching one year that we’ve been together now and I’ve loved every moment. I still find it hard to believe that even though we were born thousands of miles apart our paths crossed like they do. I’m very grateful for every moment you give to me. From the bottom of my heart, I love you and here’s to a wonderfully prosperous future together! 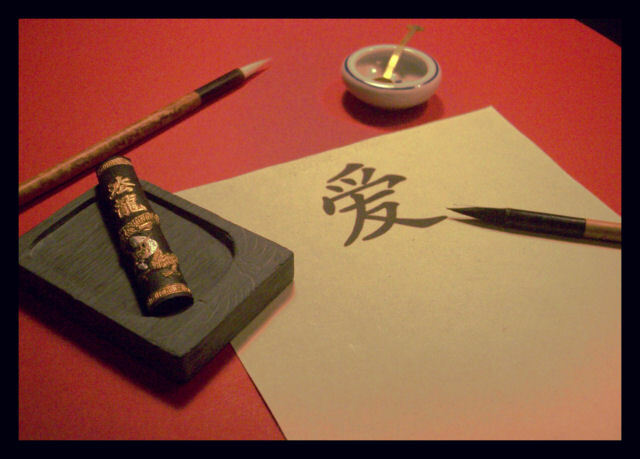 我爱你我的漂亮！ – You know my ventures into Chinese contemporary music are limited, but everytime I hear this song I think of you. This one goes out to you. The Song is in Chinese, but English subtitles are in the video! On an unrelated random note also, I’m writing out a post about a love song, yet I’m actually listening to some heavy metal as I write – such are my spotify playlists! I feel as though it would be a crime not to post this. Since meeting my wonderful girlfriend (who I know reads this blog!) I’ve discovered some of the most wonderful music that I’ve ever heard, but I would of been unlikely to seek out before. As well as some of the contemporary offerings from the Chinese music scene, I’ve fallen in love with the traditional music of the country. Todays post is a blend of the two. The first time I heard this piece was a short while ago and it’s had regular rotation on my ipod ever since. I saw a quote on a youtube video which said that ‘Music is the international language of the world’ – I feel as though that may be non more true then with this performance.